Where is the field going? Where is it taking this generation of anthropologists? And where can we take it? This conference asks participants to consider how this generation of anthropologists will shape and be shaped by the field from both inside and out. 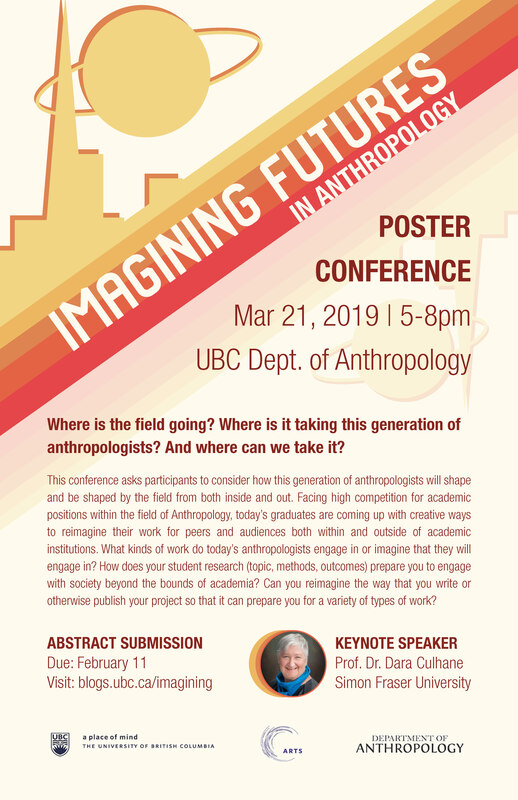 Facing high competition for academic positions within the field of Anthropology, today’s graduates are coming up with creative ways to reimagine their work for peers and audiences both within and outside of academic institutions. What kinds of work do today’s anthropologists engage in or imagine that they will engage in? How does your student research (topic, methods, outcomes) prepare you to engage with society beyond the bounds of academia? Can you reimagine the way that you write or otherwise publish your project so that it can prepare you for a variety of types of work? The keynote speaker is Dr. Dara Culhane from Simon Fraser University.